Excerpt from a much longer piece I wrote for Groundviews (The Sri Lankan President’s Twitter archive and Propaganda 2.0: New challenges for online dissent), dealing with an archive I created that captures every single tweet published by the Sri Lankan President’s official Twitter account, and why this is so important. It is evident therefore that the President’s new media presence isn’t seen as a vehicle of engagement with society and polity, but rather, an extension of his government’s policy to pass off propaganda and partisan perspectives as news and official updates. 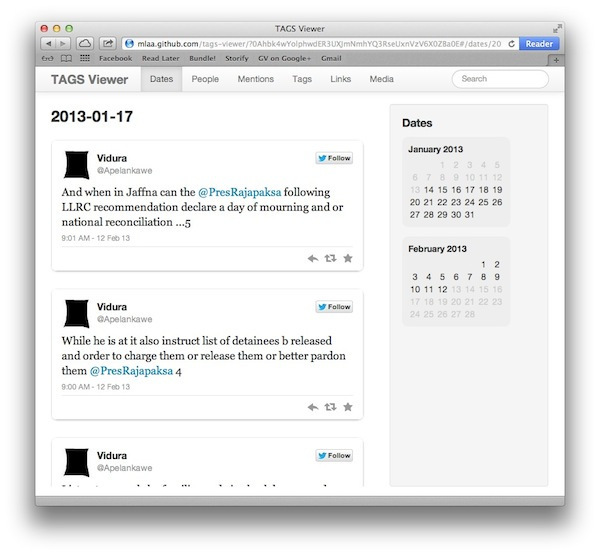 Because of what’s stated as well as the damning silences and evasion, Groundviews felt it imperative to record for posterity all the tweets published by @PresRajapaksa as well as all interactions referencing this official account, starting from Day One. Groundviews is pleased to present a novel and easy to use front end to a comprehensive archive, constantly updated, of the President’s interactions and content generation on Twitter. To see all the tweets (updated daily) access the full spreadsheet here. 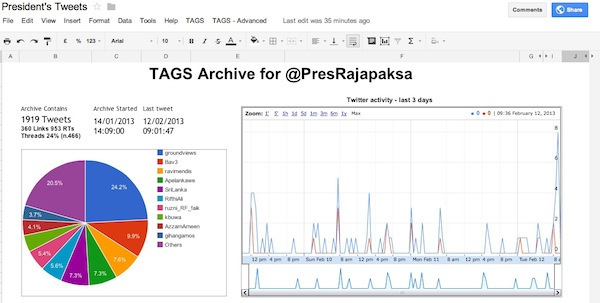 There is also a data visualisation giving top-level information about @PresRajapaksa accessible here. Though the screenshot of the dashboard below is accurate at the time of publication, the link will always open a page with updated statistics.